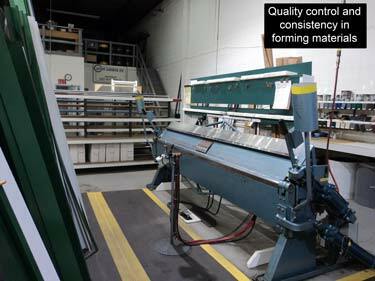 Our staff at Custom Cladding Ltd. has over 35 years experience with window and door products, manufacturing and installation of these products. This experience has helped us develop what we feel is the most 'Professional after market cladding system' available, that will give the 'Maintenance free' aspect most people are looking for with today's busy lifestyle. WE DESIGNED THIS SYSTEM AROUND CRITERIA USED BY WINDOW MANUFACTURERS. Ensure the cladding MATERIAL FITS TIGHTLY to the window or doorframe and not leave unnecessary gaps or hollows under the metal. THE EXTRA BENDS ADD STRENGTH AND IMPROVE APPEARANCE. Make the cladding system REMOVABLE & REUSABLE so that customers can reglaze (replace glass) their windows if it becomes necessary in the future without having to pay to have their window re-clad. Make sure the cladding material DOES NOT INTERFERE WITH the operation of opening windows or change or hinder the PERFORMANCE AND SEAL OF THE WEATHER STRIPPING on these windows. FINALLY AND VERY IMPORTANT - We use a high grade of caulking to ensure the cladding is properly sealed against water penetration. That is why we use a commercial grade acid based silicone. This silicone is a one-part RTV Silicone Sealant/Adhesive for general purpose, glass, metal, doors, windows and bath/kitchen fittings. It remains flexible from -70F to + 480F (-60C to + 250C) and it will not crack, crumble or dry out. This silicone is unaffected by ultraviolet, weathering, most chemicals and solvents. It adheres to metal, wood, glass, fiberglass, ceramics, fabrics and many plastics and will resist mildew. With the above criteria in mind, we also decided to add one more quality control point to our operation. We would FORM ALL OUR MATERIAL IN OUR SHOP instead of the older traditional method of bending the material on site; usually the customers front lawn or driveway with a 'portable brake'. This step allowed us to make use of equipment that while not portable and more expensive to purchase would improve ACCURACY & CONSISTENCY in forming our cladding material. It also allows us to use a STEEL GALVANIZED material that is available in the SAME COLOURS & from the SAME SUPPLIERS of the aluminium capping coils. STEEL DOESN'T EXPAND & CONTRACT in the heat and cold as much as aluminium (approximately 1/3 that of aluminium). This allows us to fit our materials tighter and greatly helps reduce 'oil canning' ripples that appear, usually due to expansion and contraction of materials, from hot to cold. HAIL DAMAGE IS LESS LIKELY with steel. STEEL WON'T OXIDISE like aluminium (dulling of the paint surface) and the product is galvanised against rusting, primed & painted with a high-density polyester colour finish.